Welcome. Pictures of my Kitchen Kamikaze lutherie. If you're going to do some, go read Frets.com. 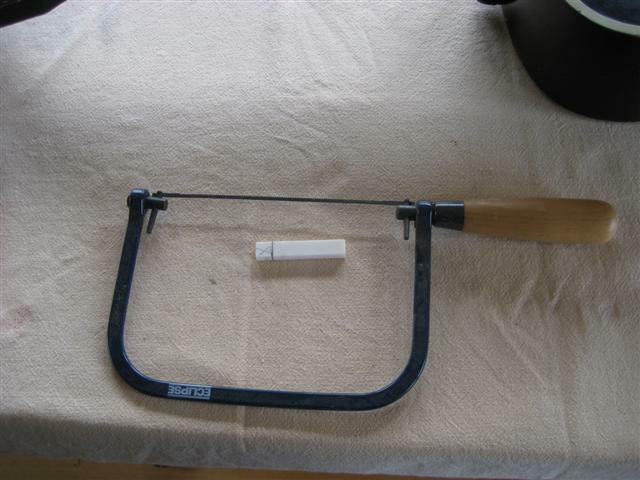 There is an excellent article at www.stewmac.com and they sell all the parts, tools, etc. you need too, though I am just using stuff from around the house. First up, bridge crack cosmetic and future proofing to prevent further cracks. Then, beginning the process of nut replacement. 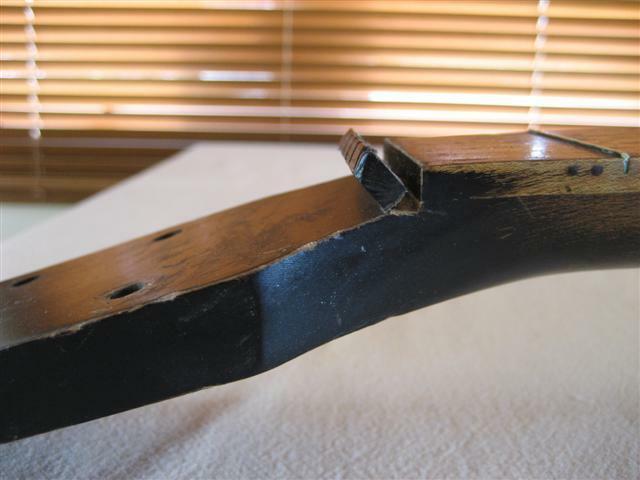 Later on, using food to prevent further cracking around a bottom strap button by installing cleats and the completion of the nut replacement. An earlier shot of the bridge. Missing two bridge pins, some cosmetic cracks but structurally sound. Not a great picture, I couldn't find the camera this morning so this is an older picture. I decided to fill the cracks and the grooves from the strings. I cut some cotton buds (q-tips) in half, put some cello-tape (scotch tape) around them and stuck them in the holes so the glue wouldn't seep. 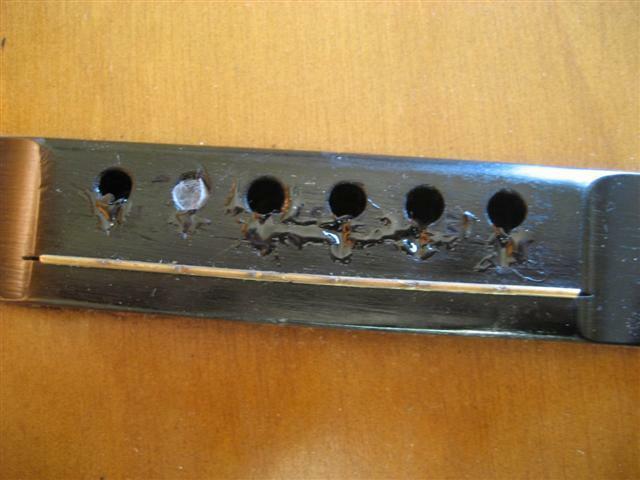 I also put a strip of tape at the bottom of the bridge pin holes from inside, so no glue could run down. 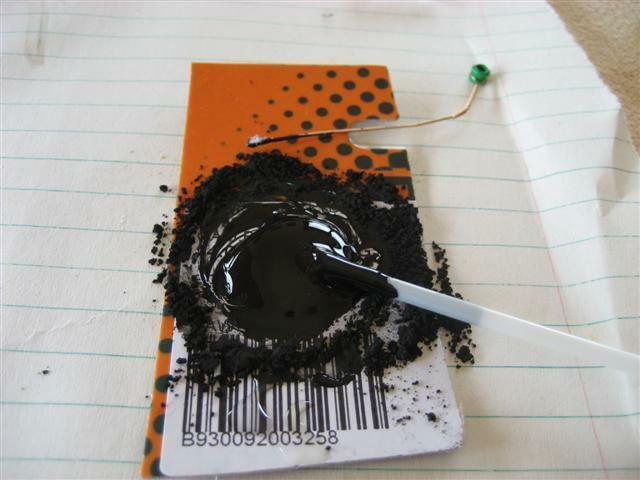 Then I mixed the two part epoxy glue with powdered black and filled. What you're looking at here is the resulthardened over one night. This particular epoxy is the three-day, slower drying kind. 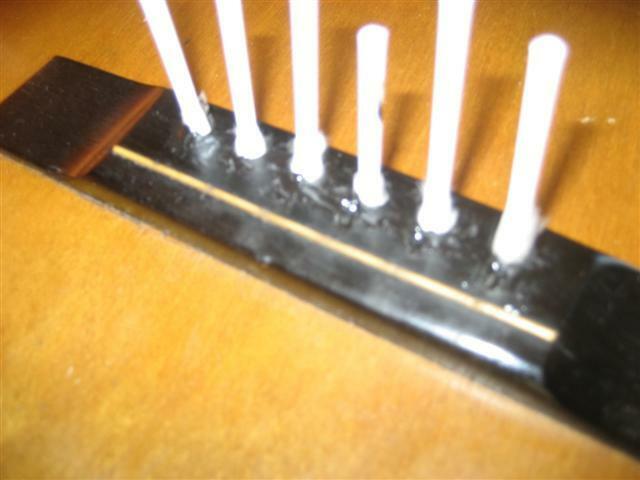 Here is a shot of the bridge with the q-tips removed. 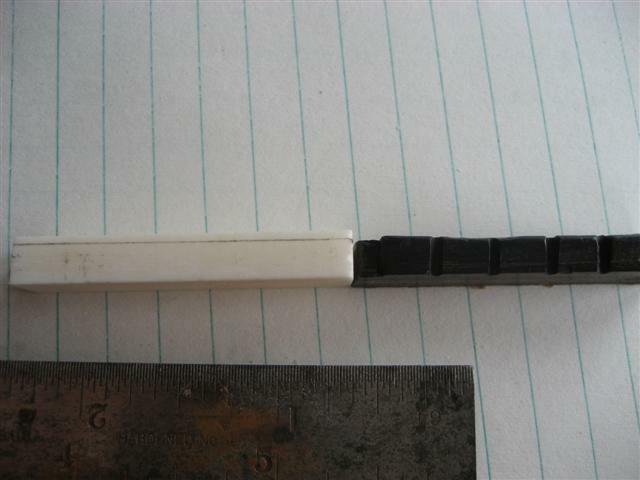 The bit of tape left in the hole came out with a tug from tweezers. I was expecting to have to re-fill with some more glue and sure enough there are still dimples where more glue needs to be added. I add more glue later down the page. 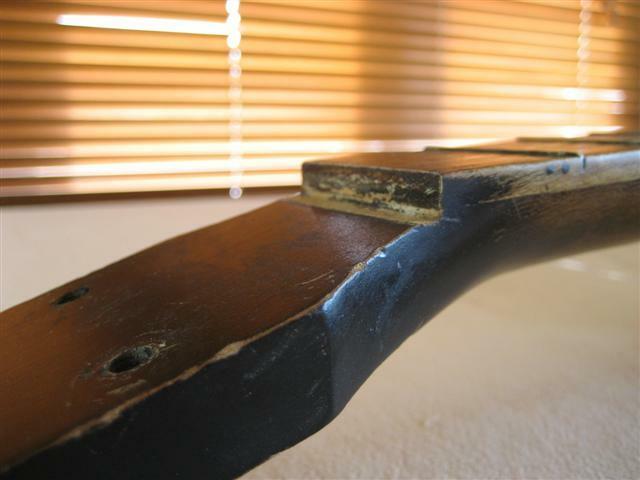 When the holes and cracks are filled "proud" (higher than the surrounding wood) and hardened I'll sand the bridge so the height of the glue matches the bridge. Here are some of the materials laid out. 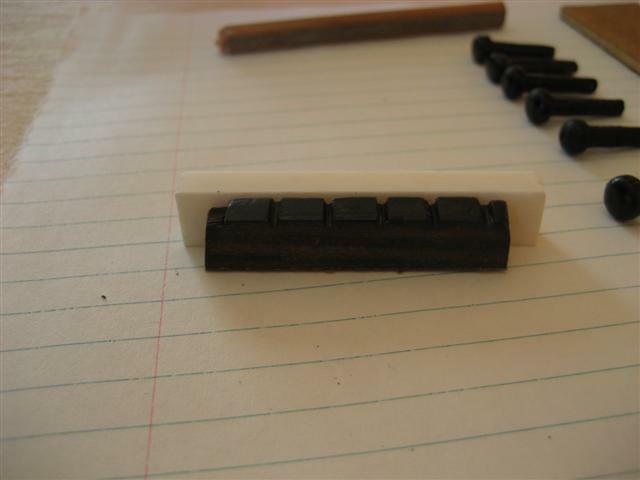 There's a piece of rimu doweling I made two new bridge pins from. 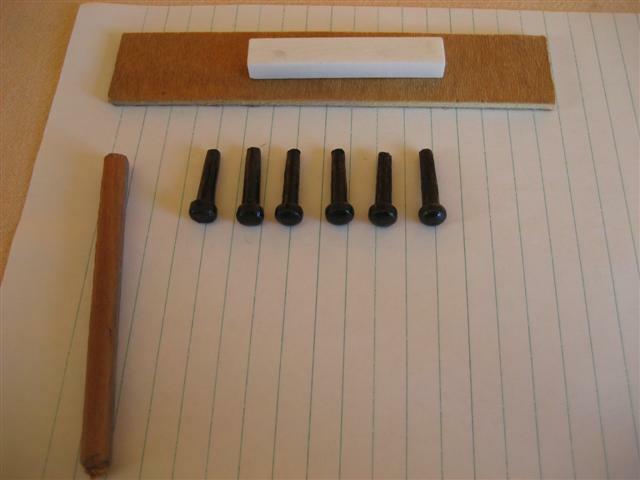 The four original bridge pins and my two remakes are on the right. Above is the new nut blank and the cleat I'll use to brace the cracks near the strap button. 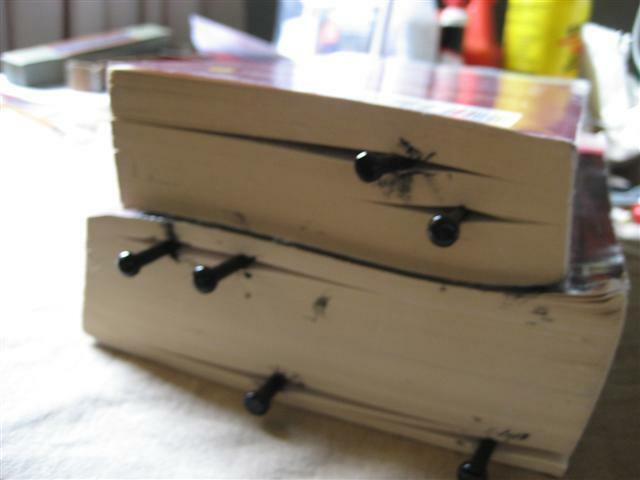 Here I have my fancy bridge pin holders to hold the pins while the second coat of paint dries. I would have used blue tack to hold the pins up by the end but I didn't have any. A novel idea, hey? The paint is just some left over black lacquer I had from refinishing some metal drawer pulls. See that blue topped container? All my screws, bushings, tuners are in there. Whenever I work on something I keep all the parts in a sealed container, that way nothing gets lost. I'll also make diagrams of how things go back together if need be. I also label parts on the back in pencil. It can save a lot of heart ache later. 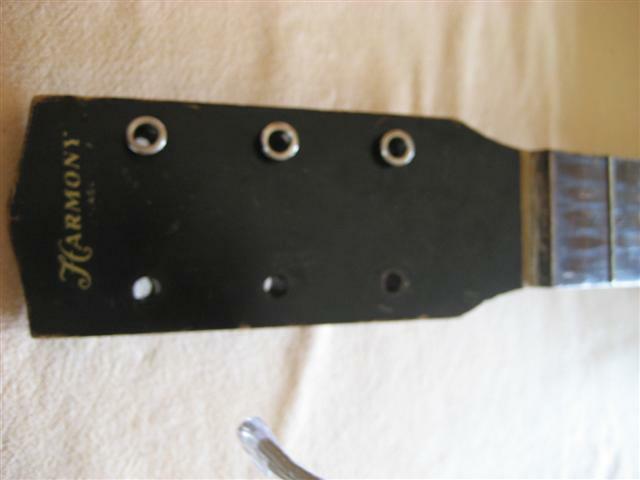 In this case the simple tuners didn't need diagrams and I have a picture in any case to make sure they go back on right way up. In preparation for knocking the nut off, I am scoring all the way around it with an exacto-knife (box cutter). This will prevent any chipping of the wood. A single gentle tap on the hammer is all it took. 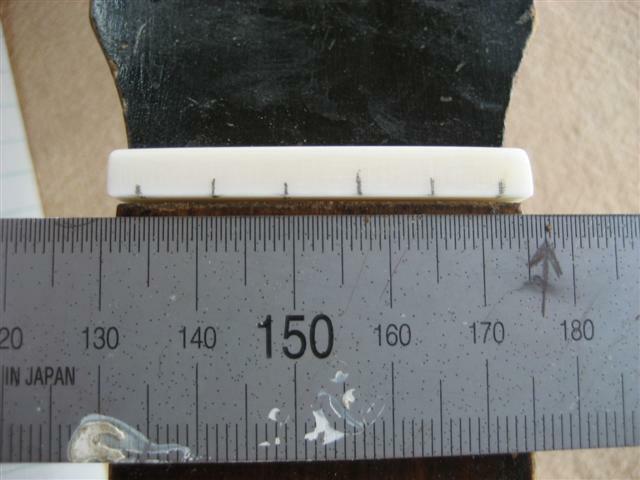 The wood block is used to prevent any damage, I want the old nut in good nick. I'll save it for the next owner but also so I can use it as a template to make the new nut. A shot of the nut before I take it off completely. The old nut against the nut blank. I take this opportunity to admire my new tuner ferrules and check their fit. The guitar came without any and k1w1 supplied me with a whole new set. This should make the guitar tune much easier plus it will look a lot tidier. These are a perfect fit and will press in and stay pressed in. 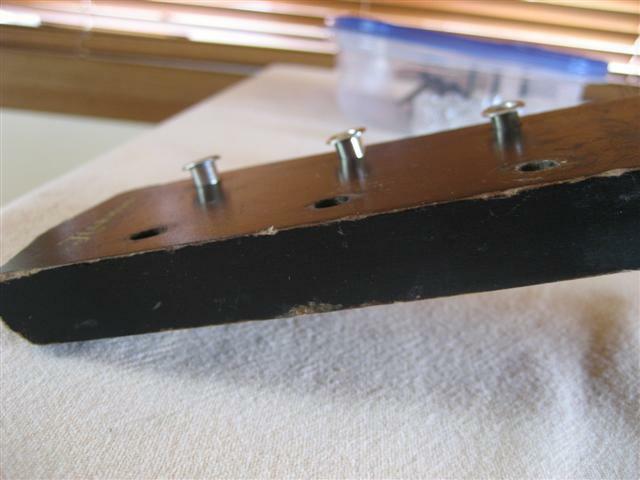 I'll either put a bit of wood on the top of the ferrule and the bottom of the guitar to protect it and push them in with my C clamp, or else I'll put a bit of wood on top of the ferrule, support the head with my hand and tap them in gently with my small hammer. I'll decide that later. For now, back in the lidded box they go, wrapped in bubble wrap. 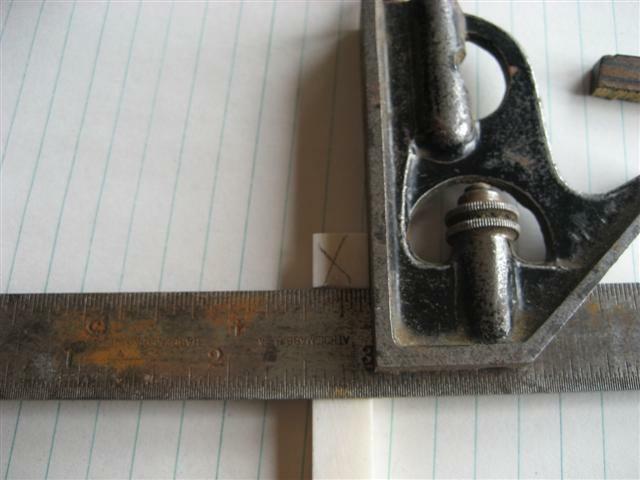 Here I am using my Father in law's little t square/level to mark the bit of nut I need to cut off. I've used this tool hundreds of times for small jobs. The handle slides so you can measure things as well as mark right angles. The leveler bubble isn't all that accurate for big jobs and so for big stuff we use a meter long proper level. I always put an X on the cutt off part, it's a good habit if you sometimes have bits where the cut off part is questionable. I always cut on the X side of the line I draw, that way the saw width is taken into account. Otherwise, you might cut it short. Here is the jewelers saw I will use to cut the nut. I think the proper name for this saw is a coping saw but the first time I ever used one was on a piece of jewelry so I have forever after called it a jeweler's saw. You can get different fineness of blades for these, and you just replace them as required, they unscrew from the handle. I'm just using the blade I already happened to have. 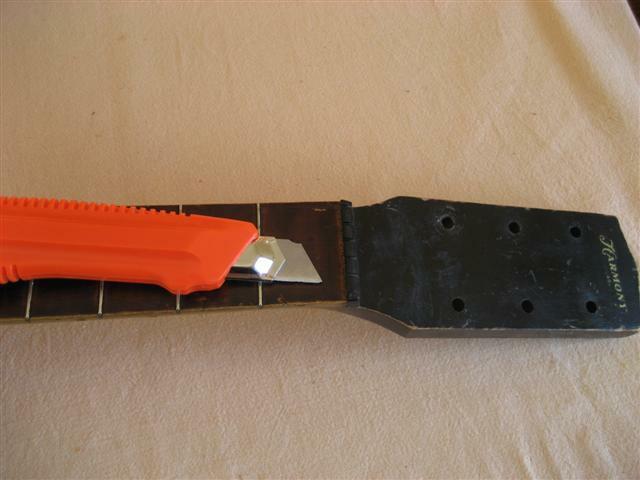 I'll also use this blade later for making the grooves in the nut, it seems to be the same width as the groove my other guitar has for it's high e string. I have some small files but they're all bigger than the teeth on this saw. 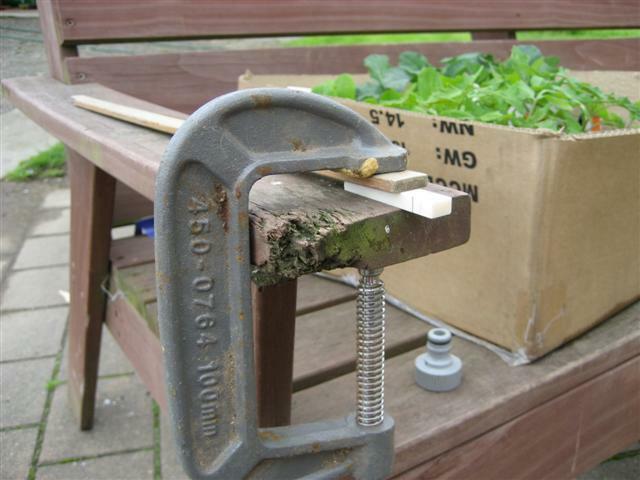 My C clamp is holding the nut to a garden bench I made about ten years ago with just a miter saw, lol. The dog chewed the arm when she was a puppy. 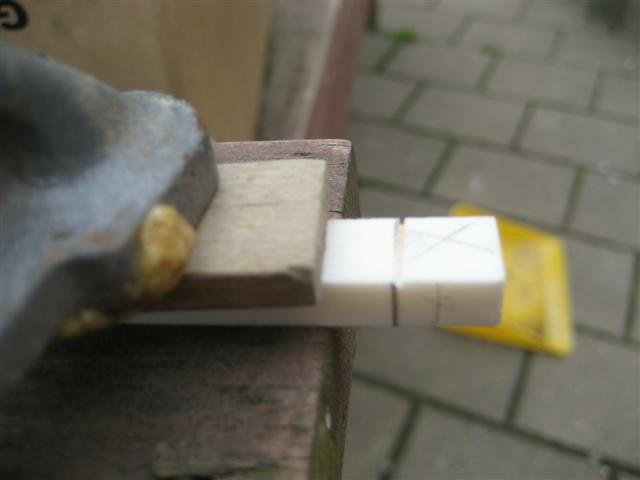 The wood between the clamp and the nut protects the nut. Those C clamps are incredibly useful. 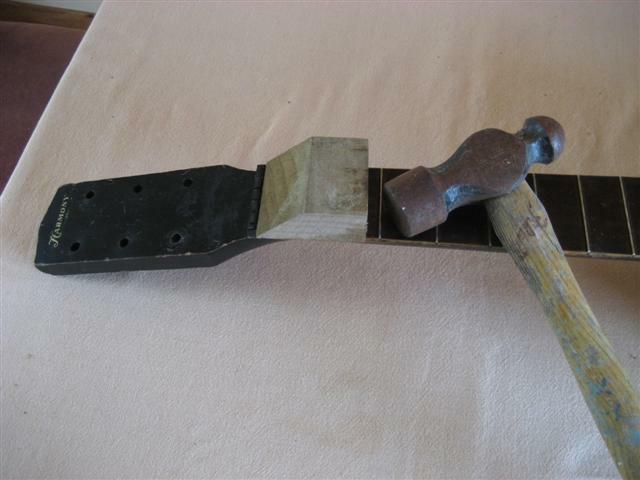 I practically rebuilt all the woodwork in my house with a few of those, a belt sander and carpenters yellow glue. A close up with the groove started from the saw. I moved it over for the last third, so the nut wouldn't snap under pressure. 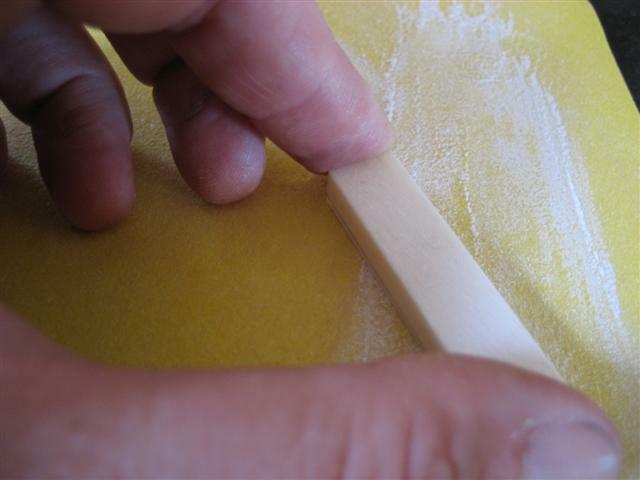 Now the right length, I have marked the width to sand to the line. Sanding. I used three grits. Here are the grits I used. 80,120,240. I didn't polish it fine (yet). The site the nut sits at is on a slight angle. 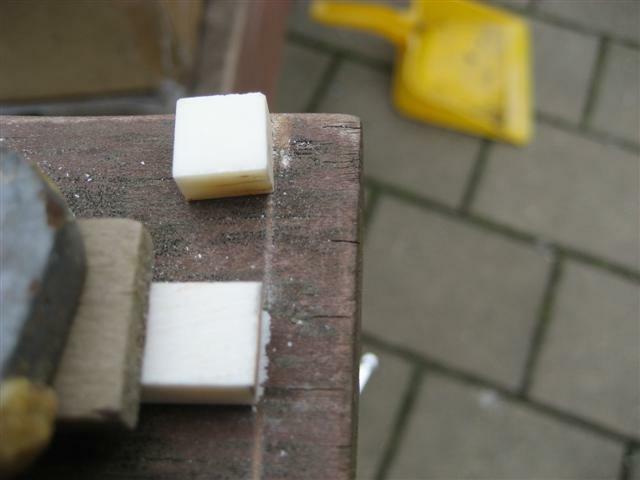 I sanded the bottom of the new nut to match the angle but there was still a bit of rocking on my straight edge due to the surface of the head being uneven so I did a bit of filing of the head on both surfaces the nut was going to be glued. 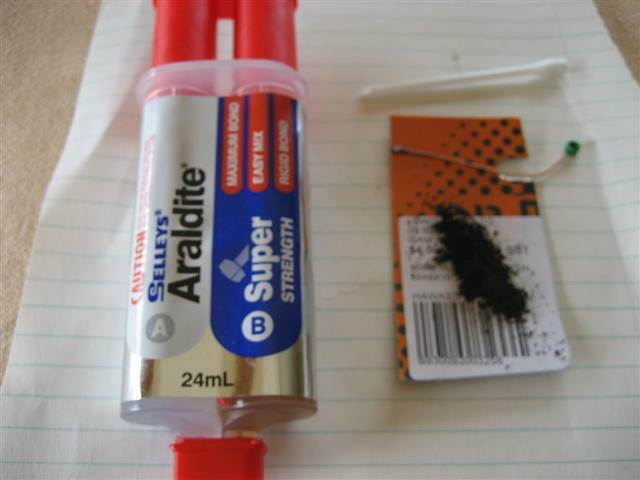 You need to do this anyway to get rid of any old glue etc. 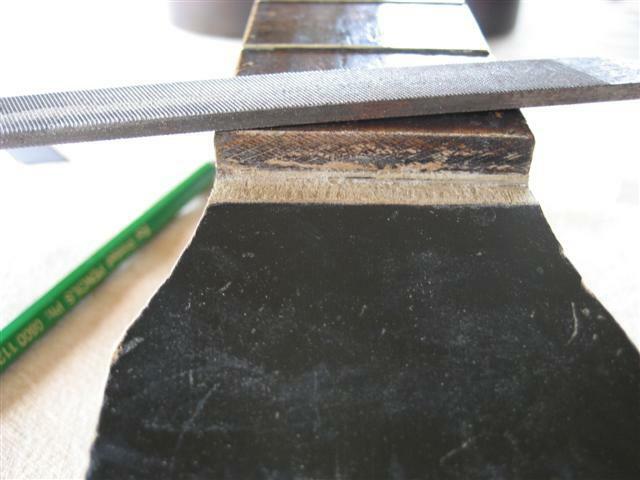 A tip for a good straight edge to check high frets or slightly high areas like this is to use the back of an "exacto" (box cutter) blade. Just take it out of it's plastic case. They make good, cheap, straight edges. 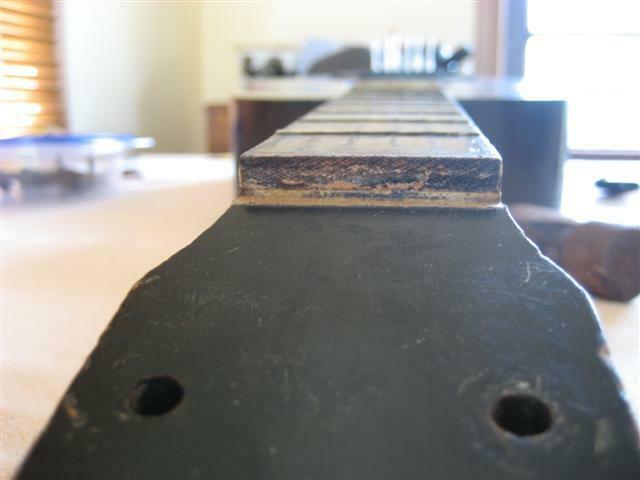 You can snap them to length if you want to check for a single high fret for instance and need it to be three frets long. They're nice and narrow so you can check all along the length of the fret wire and beside each string. 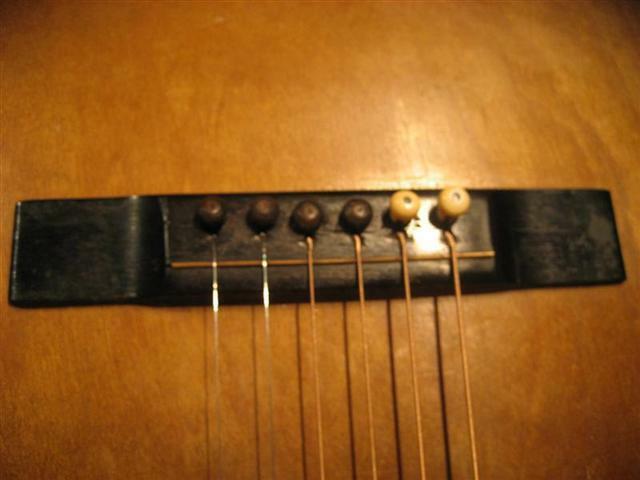 I rounded the back edge of the nut, took the sharp edge off the side, then marked where the strings will go based on the old nut's spacing. I used a ruler that measures to half a mm to do that. Frets.com says uneven spacing isn't noticeable while playing but it would annoy me anyway. 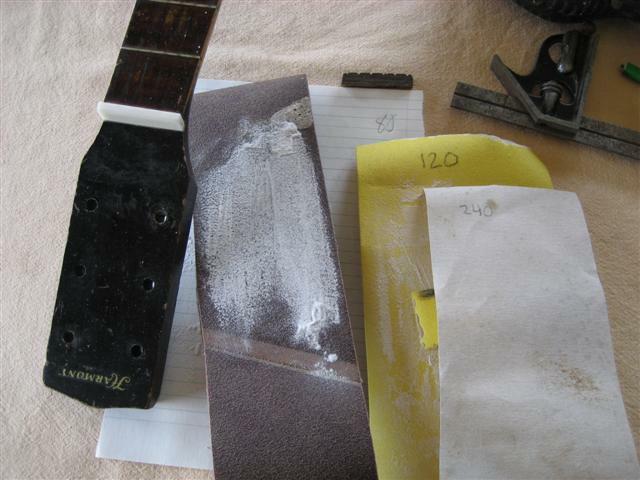 I can't do anything else with the nut until I am ready to put the strings back on and I have a few more things to do before I get up to that, so I mix up some more epoxy and black powder to finish filling those holes and cracks and put the rest of my gear away. 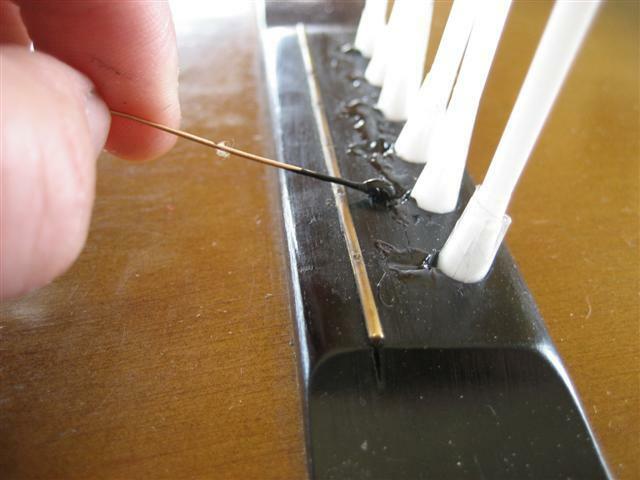 I mix the two part epoxy with another q-tip with the head cut off. The old guitar string will be my applicator. 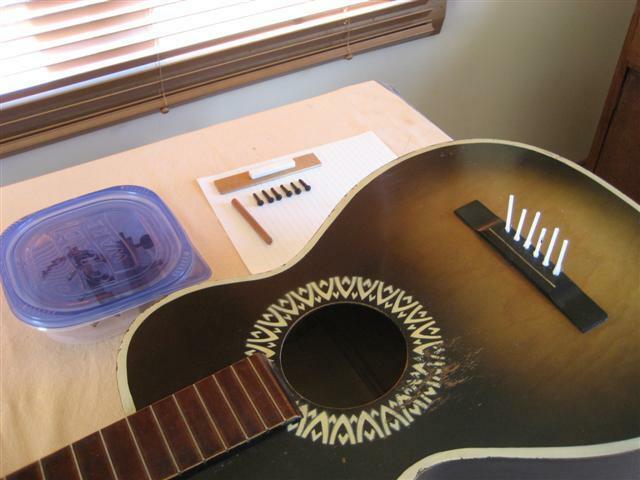 I have to wait ten minutes and re-stir before I apply the glue, so I am cleaning the parts of the guitar I couldn't reach with the strings on. 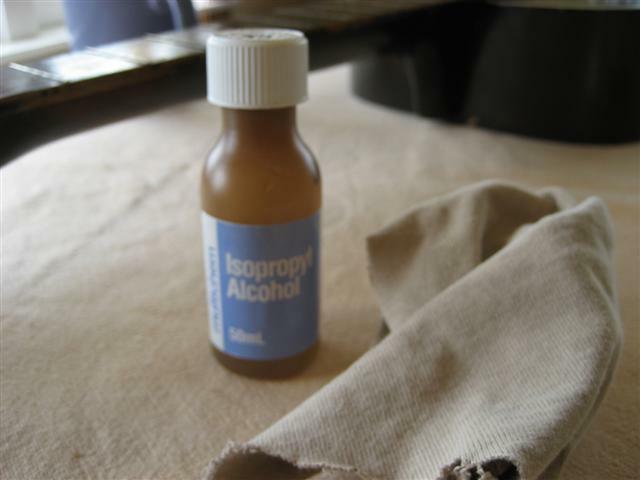 To do this I am using fifty percent isopropyl alcohol mixed with fifty percent tap water. I also use this on my laptop screen. It cleans without smearing and works better on the laquer than soapy water plus it evaporates very quickly. I am applying it with an old, lint free, 100 percent cotton t-shirt which won't scratch. I find this works best if you buff with another dry cotton t-shirt cloth as it dries, much like you do with window cleaner. It doesn't get rid of that odd film you get with this old black paint and nitrocellulose lacquer but it works better than anything else I tried. 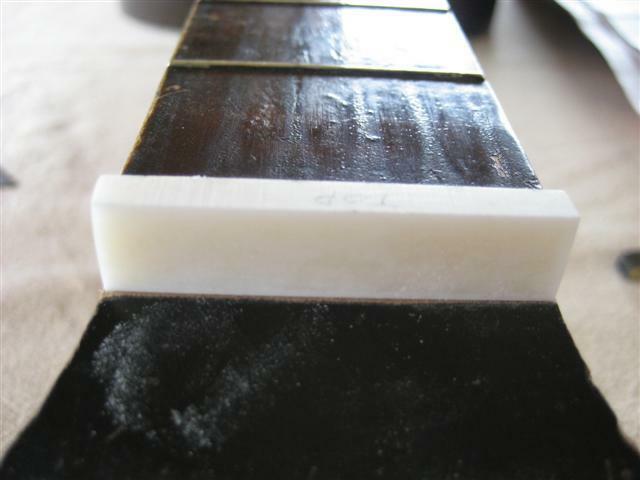 A bit more black gunk removed from the fingerboard, it's now time to apply my next layer of glue. And that's it for today. I set the guitar aside to dry and put the rest of my stuff away. Want to see the scary things that happens next?